It seems that at least some of winter has finally arrived in New England. 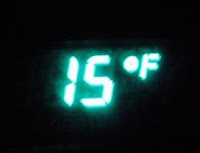 This morning when I got up, the thermometer read 6F (-14C). Still no snow here, but it was plenty cold all day. After work, the temp was a balmy 15F (-9C). What to do? Ride, of course! I dressed in multiple layers - wool ski socks, bike shorts and knee warmers as the first bottom layer, and then a pair of wind proof winter tights over top; sports bra, undershirt, wicking hoodie and lined wool jersey topped with a wind vest and jacket on the top; added toe covers over my wool socks, and slipped on my Lake winter shoes for my feet; hands had a pair of liner gloves with an outer layer of fleece-lined ski gloves; fleece earband, hood (from hoodie) and helmet on my head. I felt like the Michelin man. I headed out with the boys. Riding the road to get to the woods was chilly - my face got a little cold, but the rest of me was ok. Once we were in the woods, I quickly warmed up. 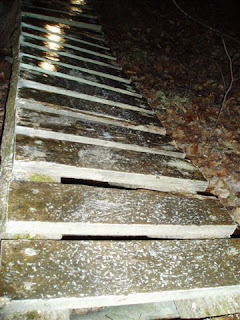 After a few days of rain, and then cold temps here, the trails were pretty solid, but not as icy as I expected. The ice came whenever we needed to cross a bridge. After doing some really fun riding, it was time to head home when my feet started to get really cold. I ran for awhile on one trail just to try to get them warmed up some! The only issue was that the ride home was mostly downhill, and a lot of roads, making it VERY COLD; in fact, I ended up with an ice cream headache on the way home! Changed into warm, dry clothes and ate some dinner, so am warm and happy as I write this. Crazy? Yes indeed. 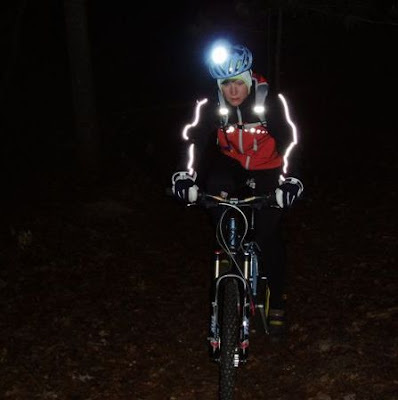 We usually do one really cold ride a year though, and have ridden in colder temps. Managed to ride 10.5 miles in 1:40. I think I'll ride the trainer in the basement next week - it's definitely warmer ;-). Brrr. I thought it was cold enough here in Ottawa heading out for food yesterday with a -31(C) windchill. I couldn't imagine being that energetic while that well wrapped. Glad to hear you enjoyed such weather, though. And thanks for passing along your blog address! I'm still cold from last night. Ooff!